Chapter Arts Centre in Canton has been a perennial favorite of Mrs. SF and I for many a year. I love the cinema (can’t take food or drink in so don’t get anyone annoyingly eating a three course meal sitting behind you – whoever thought nachos were a good idea as a cinema snack needs shooting!!) and the bar and food offerings are both very tempting. In short a nice place for food, drink and a bit of culture. I have noted with interest when they set up an outpost (on the food and drink front) down in Cardiff Bay during the Summer. A brisk walk from my office, I vowed to get down there for lunch sooner rather than later, but as ever time has run away from me and it has taken me until close to Christmas to get there. A refreshing autumnal (verging on wintery) day got me off my backside and away from my desk, with a route march from my office to the second outpost of Chapter, Caffi Sio, with a bit of an appetite. 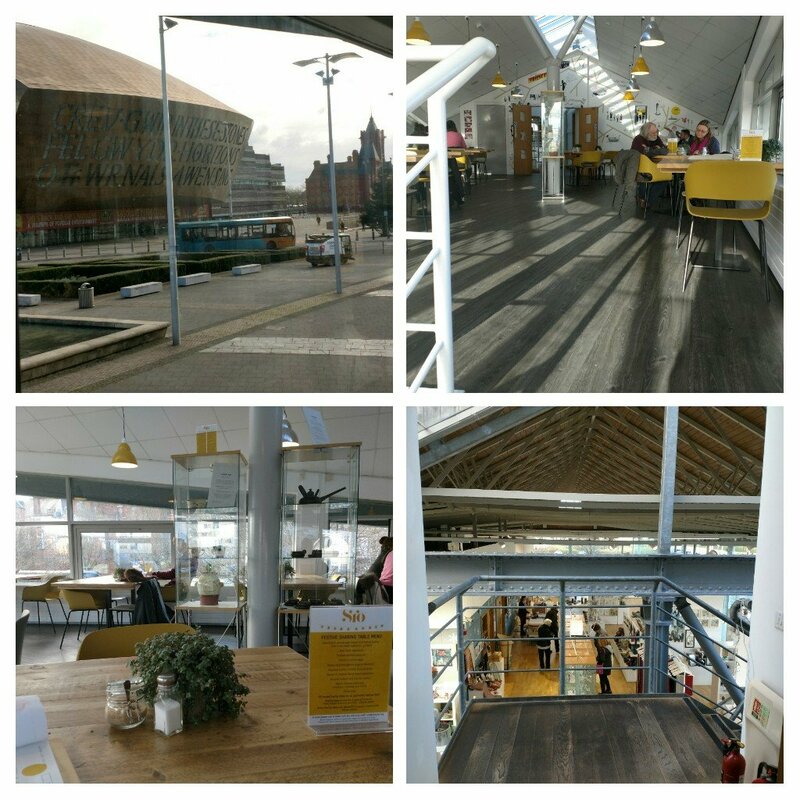 Located opposite the (marmite – you either love it or hate it architectural wise) Wales Millennium Centre (I personally quite like it), it is a pleasant enough space with seating upstairs or outside (if the weather permits and you are wrapped up enough), for a bite to eat. Slightly stark inside, but with a rather nice view of the Millennium Centre. You order food and drink at the counter and open kitchen downstairs and the food is then bought up to your table upstairs. On the food front the menu, on the face of it, looks very inviting with a mix of more brunchie or lunchie dishes (prices ranging from a fiver to a smidgen under a tenner). The items on offer certainly sounded enticing, with things like Asian fried chicken (I passed on that as nothing could top the Taiwanese fried chicken I had at Bao recently) and lamb tagine. I was, however, looking for something a little bit lighter so gravitated to the brunch side of the menu. 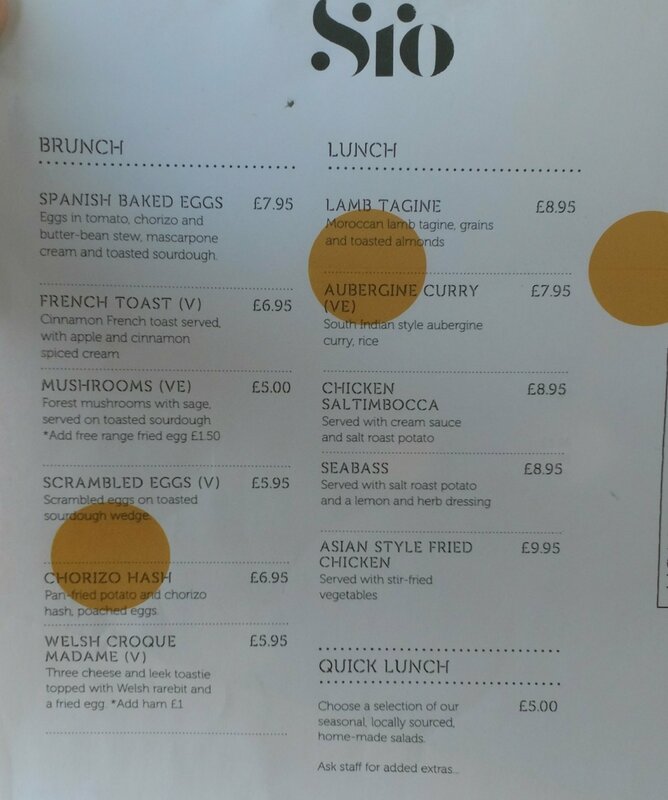 After toying with both the Spanish eggs and the mushrooms on toast, I plumped for the chorizo hash (£6.95). I am a big fan of a well done hash, especially when chorizo is added to the mix (a fine substitue for proper corned beef i.e not the stuff in the tins). What arrived was a as pretty as a picture plate of food. Very nicely presented, but did it follow up its rather enticing looks on the flavour front? 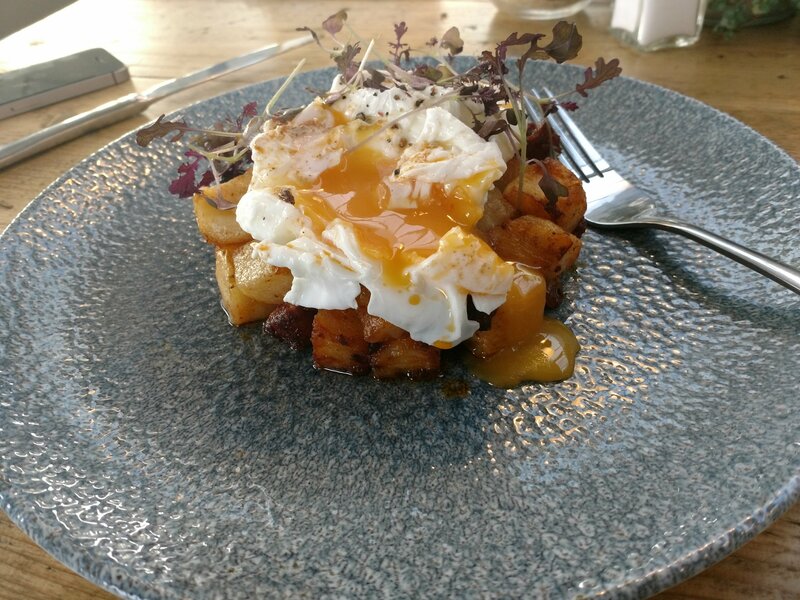 To me a hash can be a lovely thing if done right (crispy fried potatoes and a properly runny egg being an absolute must) or an absolute horror show (undercooked potatos and/or overcooked eggs – yuk) if not. The Caffi Sio’s hash was, I have to say, bang on the money. The two perfectly poached (rather than the more usual fried) eggs oozed glossy orange loveliness when gently prodded with a fork. 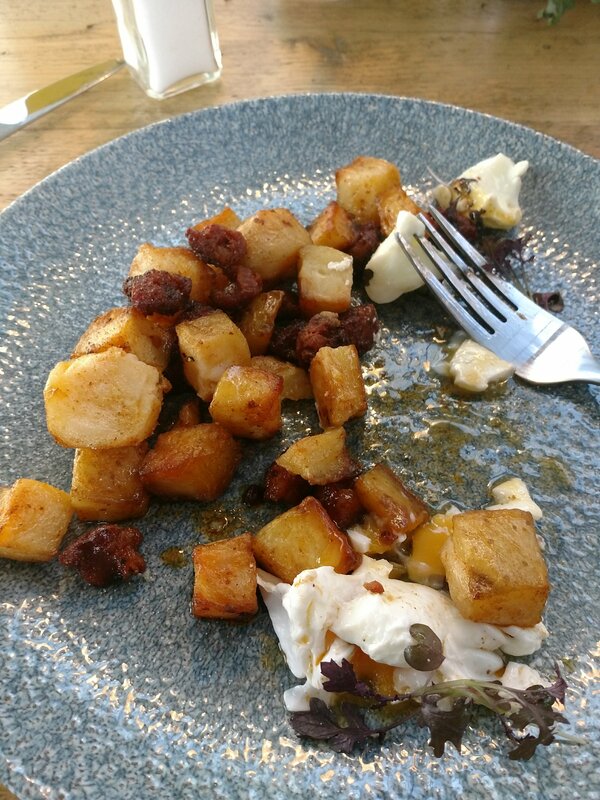 The resulting flow of eggy gold melded beautifully with the potato and chorizo combi below. The potatos were perfectly cooked so they had a crisp, oil free, exterior and a light and fluffy interior. The addition of paprika rich chorizo added a nice spicy zip to the dish. Chorizo when not cooked properly can have a rather unpleasant, mushy, oily texture, but here the exterior had a nice crust to it whilst the interior was soft but properly cooked. Lovely stuff and plenty of it. A really very good brunch/lunch dish. It was a work day lunch so no booze for me, but the list has some nice beers in the form of two from the ever reliable Tiny Rebel, an intriguing passion fruit, orange and guava number (pogo) from, recent BBC Food and Farming Award winners, Wild Beer Co and a South Pacific porter from New Zealands’ Yeastie Boys. 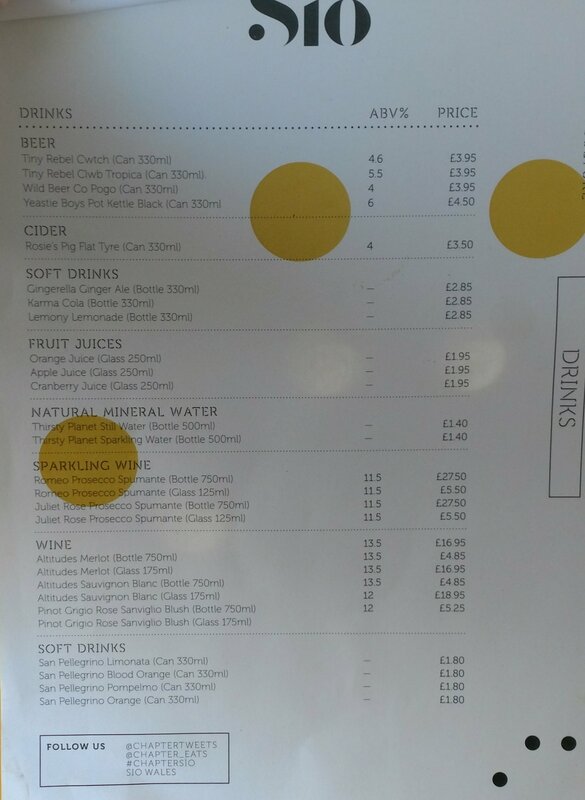 Soft drinks are interesting – I like very much both the gingerella and lemony lemonade on offer (nice to see somethings a bit different on the soft drinks front) and there is also various San Pellegrino drinks at not too hideous a price. The wines on offer strikes me as being a bit boring, if I am honest – with by the numbers sauvignon blanc, merlot and pinot grigio (rosé) – yawn – which is odd as the beers are a bit different so I would have hoped the wines would have followed suit. Heyho, missed opportunity that if you ask me. A red from Montsant in Spain perhaps (an area which offers quality at reasonable prices) would work well with the chorizo hash or perhaps a zippy riesling like Charles Smith’s Kung Fu Girl (great all round food wine). in the form of a latte (£2.70). Decent size and nice enough strength, although I have to say I am not a fan of putting coffee in a tall glass. 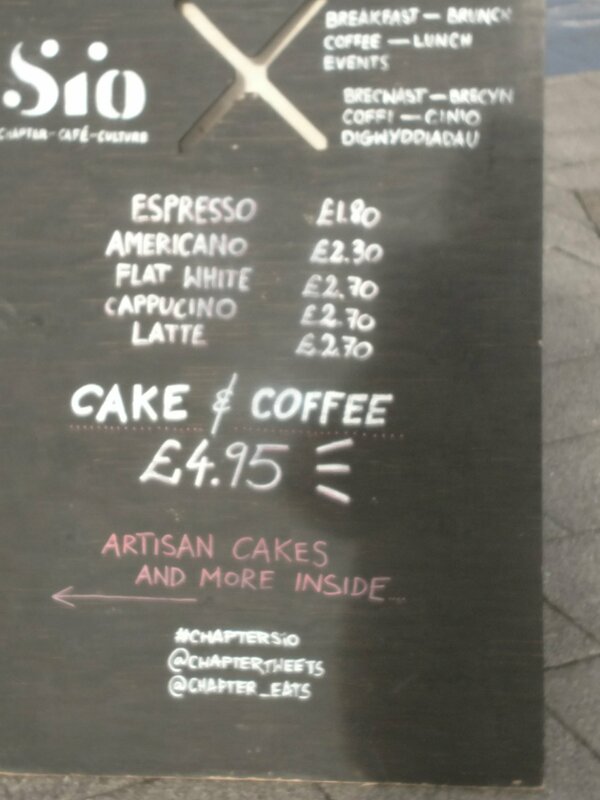 Can’t see the point personally (should have gone for the flat white I suppose). 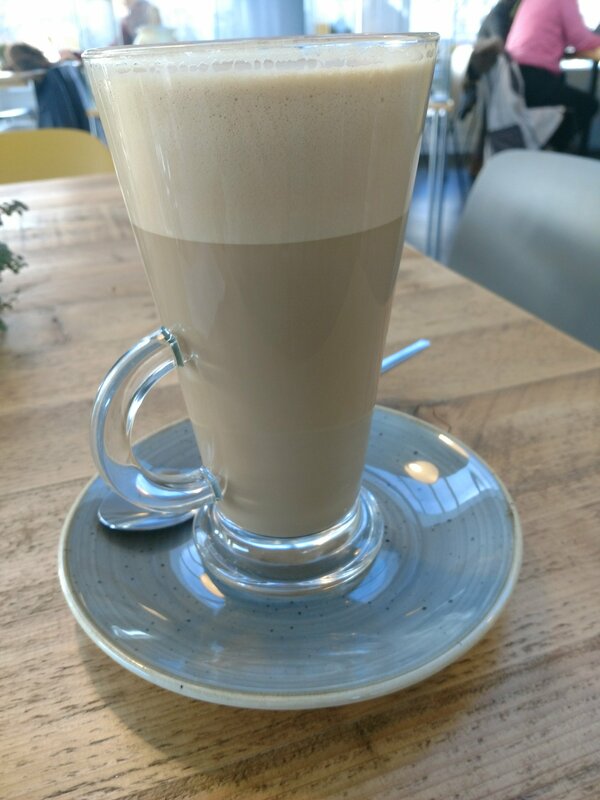 A further draw back of the beard I have grown out of laziness (naively thinking it would be low maintenance – far bloody from it) was that the latte foam got stuck in it and without a napkin in sight this was a bit of a pain. Part my fault – with beard – part their’s with no napkins in sight upstairs or downstairs (I didn’t look that hard downstairs mind). 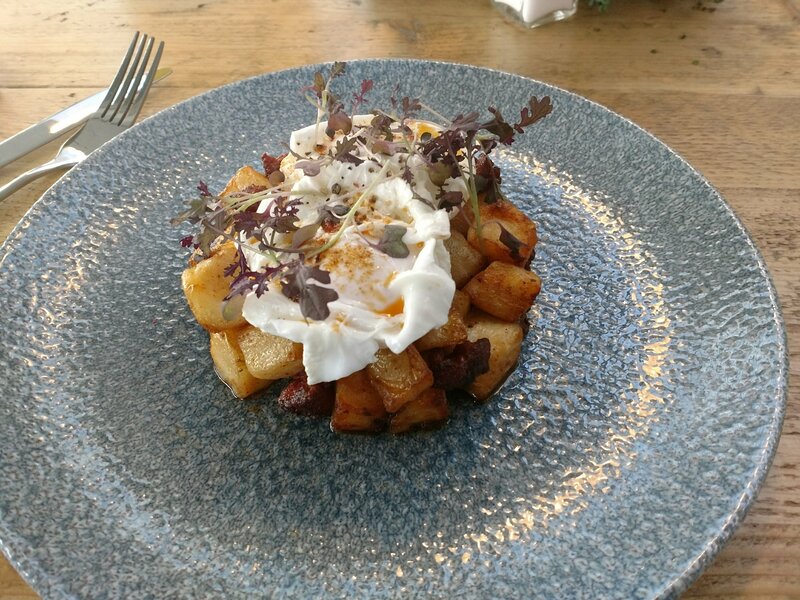 I love a good hash and the one here was very nice (every bit as good as Kin & Ilk’s effort). As such, I was very happy with my first lunch time trip down the bay to Caffi Sio. 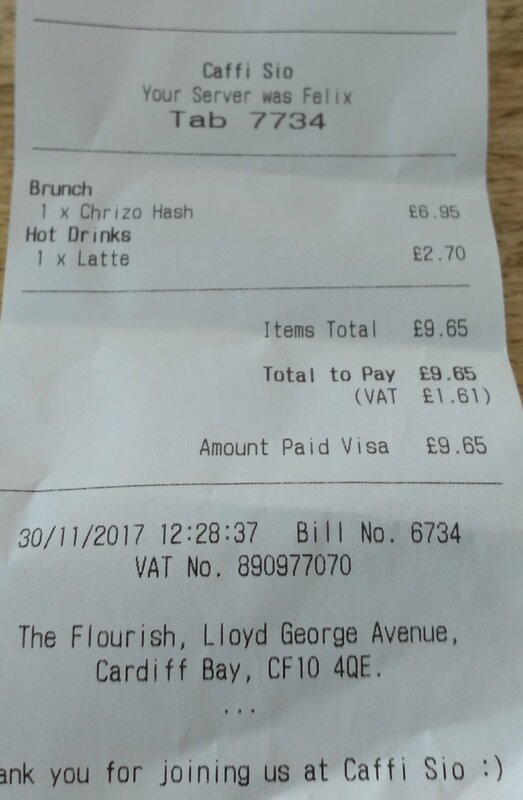 Price wise I paid, for both my hash and coffee, just shy of a tenner. Not cheap, cheap – but fair value for what I got I though. Would I go back? 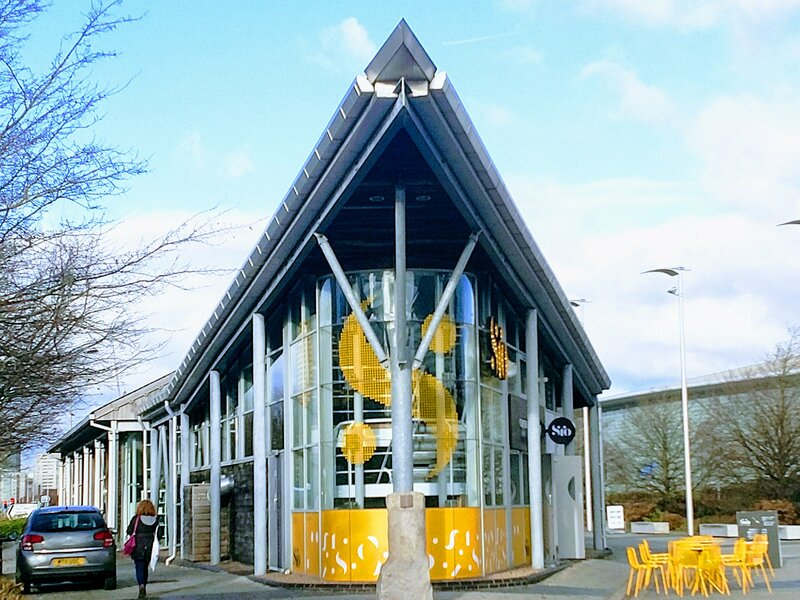 Yes – the rather nice food at Caffi Sio makes for a good excuse for me to stretch my legs and get a bit of exercise in the day. Now that can never be a bad thing. 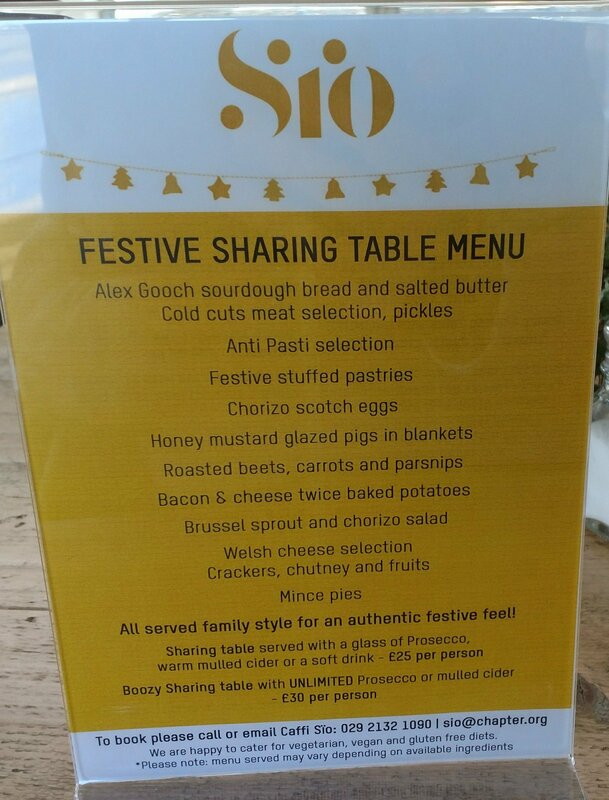 An interesting and seemingly rather good value offering is available for the festive season. Opening hours: Tues – Thurs: 09.00 – 17.30, Fri- Sat: 09.00 – 20.00 (closed Monday). 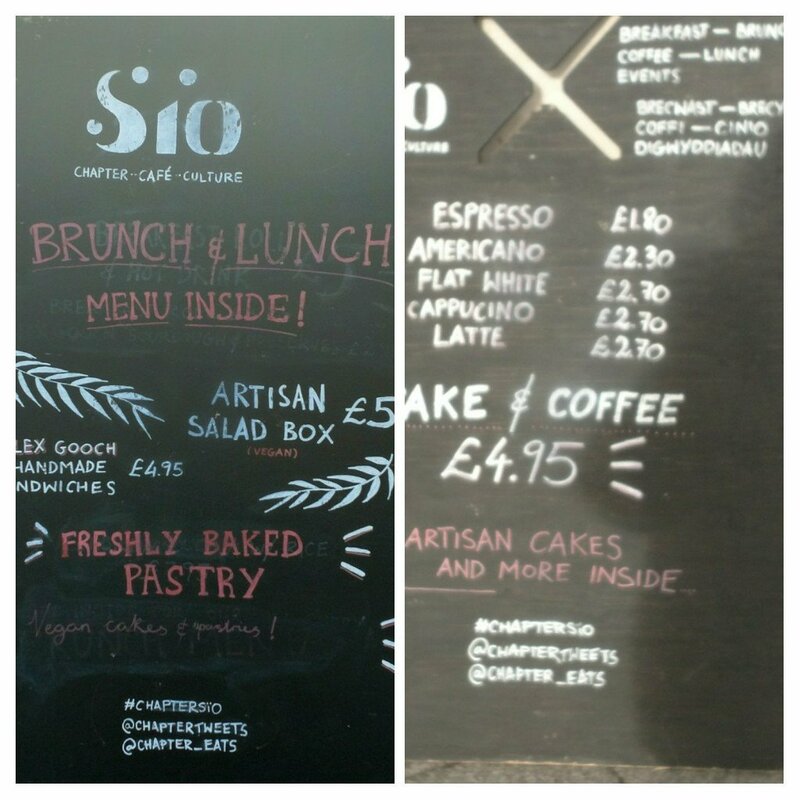 This entry was posted on Dec 10, 2017 by solicitingflavours in Alcoholic drink, Beer, bistro, breakfast, Brunch, cafe, Caffi Sio, cake, Cardiff, Cardiff restaurant, Chapter Art Centre, cheap eats, cider, coffee, craft beer, Drink, Dry white wine, Fast food, Food, Food and wine products, hash, Kin + Ilk, Lunch, lunchtime, New restaurant Cardiff, Non alcoholic drink, real ale, Red Wine, restaurant review, retail, salad, Spain, Spanish wine, Take away, Takeaway, Tea, Uncategorized, Wales, Welsh food, White wine, Wine, wine pairing, wine pairings.